Beacon Emergency Relief is one of our major initiatives to provide assistance to members of the community who are struggling to make ends meet. We have a number of trained volunteers available to assist people who walk in off the street or co-ordinate appointments with people. Our volunteers are able to sit with people to help evaluate their needs. We have an onsite pantry which is well stocked and access to financial assistance through various voucher systems set up with business that are will to make these available. Click HERE to read the story of its launch in 2009. Beacon is currently located at the Blackwood Church of Christ office. The emergency relief service is currently open on Wednesdays from 9am – 1pm. We will expand opening hours as we are able to recruit volunteers. Flight Centre Blackwood donate 1% of sales from every customer who books with them and mentions Beacon. Foodland Blackwood cover the production costs of electronic vouchers that we can put credits on. Please click HERE to download/read the Beacon Brochure that will tell you more about this ministry of local churches serving local people in the Mitcham Hills area in Adelaide. 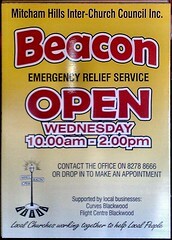 Beacon is located at the Blackwood Church of Christ office.